As I lie here with my bum ankle (broken fibula!) 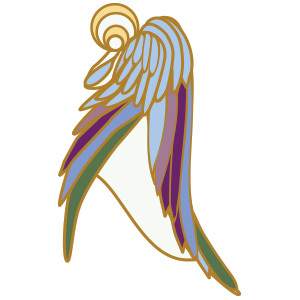 I just received the first manufacturing picture of my guardian angel enamel pin. Which started out with a messy sketch, that I then cleaned up in Illustrator, and was then created in enamel. Isn’t it amazing how we have the power to create? Initial messy sketch on a ragged piece of tracing paper. Finalizing the colors I wanted - Angels can be so many colors - usually reflecting the aura of those they guard. I didn’t want this guardian limited to one. 1” Enamel pins are on their way. Woot.